Where will your Focus Electric take you? | Donley Ford Lincoln of Mt. Vernon Inc.
Where will your Focus Electric take you? When you walk up to the Focus Electric, don’t let its appearance deceive you. 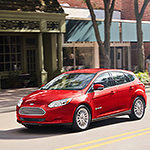 While it looks similar to the other Ford Focus models, this popular compact EV is designed to surprise you. Inside the Focus Electric, you have a 33.5 kWh liquid-cooled lithium-ion battery that can be charged with the 120V charge cord, or with DC for a fast charge. You can even set up a 240 volt home charging station to charge your Focus Electric even faster. You can fully charge your Focus Electric in about 5.5 hours. You’ll know that it's fully charged with the LED indicators light up near the charging port. These are just a couple of the features available on the 2018 Focus Electric. We invite you to visit us at Donley Ford Lincoln of Mt. Vernon Inc. to see these features when you take one out for a test drive.